Hot Springs, SD The Michael J. Fitzmaurice State Veterans Home received its newest addition today. The lobby now boasts a statue honoring the man for whom the home is named. But the veterans here still shed a deserving light on Michael J. Fitzmaurice – who in their eyes is a hero. The soldier was awarded the Medal of Honor for his actions during the Vietnam War. Fitzmaurice shielded his fellow comrades from a deadly explosive – with just his body and flak vest to protect him. He suffered serious injuries and was partially blinded by the blast, but it didn’t stop the North Dakota native from continuing a brave fight – and he lived to tell the tale. What was once a blank slab of bronze, is now a life-size statue of Fitmaurice’s legacy, which will forever live on at the state veterans home. Darwin Wolf began the project nearly a year ago in Sioux Falls. 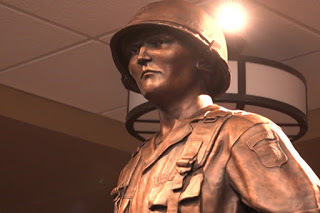 Wolf was one of three sculptors recommended for the project – and was honored to be chosen to craft a living Medal of Honor winner. Fitzmaurice now lives in Sioux Falls. The state veterans home in Hot Springs recently opened this new 133 thousand square foot building. It houses about 100 veterans who will forever be greeted by a hero at the entrance. above and beyond the call of duty. Sp4c. Fitzmaurice, 3d Platoon, Troop D, distinguished himself at Khe Sanh. Sp4c. Fitzmaurice and 3 fellow soldiers were occupying a bunker when a company of North Vietnamese sappers infiltrated the area. At the onset of the attack Sp4c. Fitzmaurice observed 3 explosive charges which had been thrown into the bunker by the enemy. Realizing the imminent danger to his comrades, and with complete disregard for his personal safety, he hurled 2 of the charges out of the bunker. He then threw his flak vest and himself over the remaining charge. By this courageous act he absorbed the blast and shielded his fellow-soldiers. Although suffering from serious multiple wounds and partial loss of sight, he charged out of the bunker, and engaged the enemy until his rifle was damaged by the blast of an enemy hand grenade. While in search of another weapon, Sp4c. Fitzmaurice encountered and overcame an enemy sapper in hand-to-hand combat. Having obtained another weapon, he returned to his original fighting position and inflicted additional casualties on the attacking enemy. Although seriously wounded, Sp4c. Fitzmaurice refused to be medically evacuated, preferring to remain at his post. Sp4c. Fitzmaurice’s extraordinary heroism in action at the risk of his life contributed significantly to the successful defense of the position and resulted in saving the lives of a number of his fellow soldiers. These acts of heroism go above and beyond the call of duty, are in keeping with the highest traditions of the military service, and reflect great credit on Sp4c. Fitzmaurice and the U.S. Army.